Montreal mayor Denis Coderre recently decided to cut funding to the borough’s snow removal service. Plateau mayor Luc Ferrandez didn’t like that. In protest, he decided to reduce snow removal services himself. The neighborhood’s residents weren’t pleased about, either. Under great pressure from residents, he reactivated those services soon after. 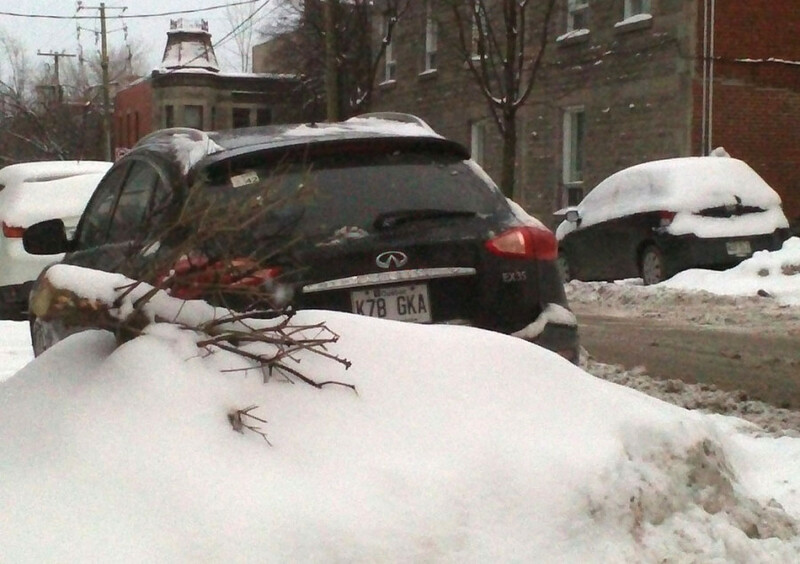 However, many feel snow and ice removal in the Plateau Mont-Royal is still horribly lacking. Luc Ferrandez has been the mayor of the Plateau since 2009. A representative of the far-left Project Montreal party, he’s mounted an aggressive campaign of restoring the borough to its former glory since assuming office. However, in doing so he’s had to make cuts to borough services. One of those being snow and ice removal – something he’s come under heavy fire for, both from residents and business owners. “This is the first semester that I have a car in the city, so this is a first for me,” explained Roxanne Sicard, a university student. “The worst part, though, are the icy snow banks. Josef Godinho was breaking up massive chunks of ice in front of his home, tossing them into a giant pile. “I’ve been a resident here in the Plateau all my life – 42 years,” he said. “It’s disgusting.” These complaints were not solely his own, his elderly neighbours have been unable to leave their homes. “My neighbors across the street – two older ladies, 92 and 98 – haven’t left their homes in two months. The icy sidewalks are just too dangerous for them,” stated Godinho. “They don’t do anything; I’m not satisfied whatsoever with the city’s service. Manuel Paul, owner of a music store on Mont-Royal Avenue, in the heart of the Plateau, had plenty to say on the state of affairs of his neighborhood. “This year, I find it’s particularly bad. In front of the Pajar store across the street, I’ve seen between 20 and 30 people fall down in the last two days,” said Paul. According to Paul, increased taxes since the opening of his business has had no correlation with improved services in the borough. “When I opened my store in 2003, I paid $750 in taxes per year. Now, I pay $3500, and what more am I getting? Nothing. “If people keep falling on the sidewalks, they need to start sending registered letters to Mayor Ferrandez,” explained Paul. “If you want to change things in this world, start by doing it in your city. If I fall and hurt myself, I’ll absolutely send them a (registered) letter. If enough people did it, things would start to happen. “If you go west of Mount-Royal into Westmount, you feel like you’re in Mont-Tremblant. There are trees and green spaces everywhere. Parking is expensive here but we see no return on our money. I’m going to renew my lease for the next four years, but if things don’t change – and they won’t – I’m moving my business elsewhere,” continued Paul. It’s hard to believe that a borough as vibrant and bustling as the Plateau can’t afford to contribute more to snow removal. Mount-Royal Avenue, one of its commercial thoroughfares, is lined with thriving tax-paying businesses, yet the sidewalks remain largely uncleared of ice and snow.